The MonkeyBoard DAB Radio Development has a hidden digital I2S port. When connected to an I2S to USB converter board like the miniStreamer, the audio will be converted into digital form for the host computer to process. 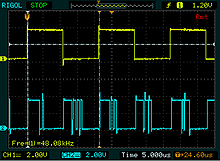 This will eliminate any analogue conversion loss and ground loop noise. Controlling the DAB FM Digital Radio Board has becoming even easier now with the LabView VIs for the DAB FM board. All function in the keystonecomm.dll has been ported to LabView’s VIs. User can now run each and every function manually and check the function return. Interfacing the radio board to other applications in LabView can be done in LabView's control interface. This tutorial shows in 4 easy steps how this is being done. The DABMonkey is a very popular DAB Radio development board that is easy to use and program. Many frontends for CarPC radio have been developed. Now with the Window's DLL ported to Linux, hacking a Raspberry Pi DAB Radio has become so simple. 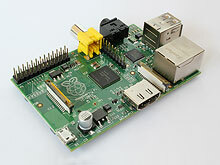 This tutorial shows how a DAB Radio project for Pi can be developed in just a few minutes. Open source DAB+ FM Digital Radio Development Board Pro with SlideShow based on the Keystone T2_L4A_8650C DAB+/FM module and a Microchip PIC18F14K40 microcontroller. 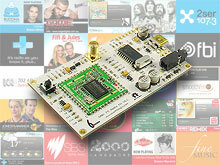 This board provides a platform for developing and evaluating DAB+ and FM receiver. The Microchip PIC18F14K50 emulates a USB virtual serial port for the T2_L4A_8650C module to communicate with the host PC. The sample code provided in this Development Board for communicating with the board is based on serial communication.